Necrotic architectures are symbolic reminders of cities undone, but also hopeful sites of development and rapprochement. “This city was one of our largest, oldest cities. There were once tens of thousands of inhabitants”. The city our guide was referring to was Shusha, the former Azeri stronghold in the breakaway Armenian republic of Nagorno-Karabakh. As we walked over broken pavements, past rusted Ladas and roofless houses, we were watched, not without suspicion, by those families and children who still live among the not-yet expired apartment blocks of the city’s ruined centre. Stepping over smashed concrete, dust, and steel rods, we proceeded quietly as our guide highlighted the violence committed both to the population and the urban fabric itself. 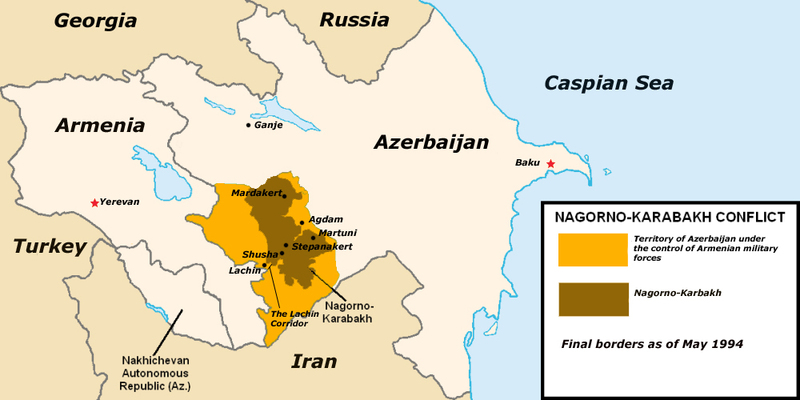 The war which led to the destruction of Shusha was the Nagorno-Karabakh War, or Artsakh Liberation War (Artsakhyan azatamart, in Armenian), which ran from the late 1980s to May 1994. During the breakup of the Soviet Republics, the emergent Armenia and Azerbaijan became entangled in a messy, “undeclared” conflict which would eventually involve direct Armenian military support in aid of the separatist guerrilla fighters. It was a war which fully “erupted” in the winter of 1992. The ceasefire, brokered by Russia, was only signed in 1994. 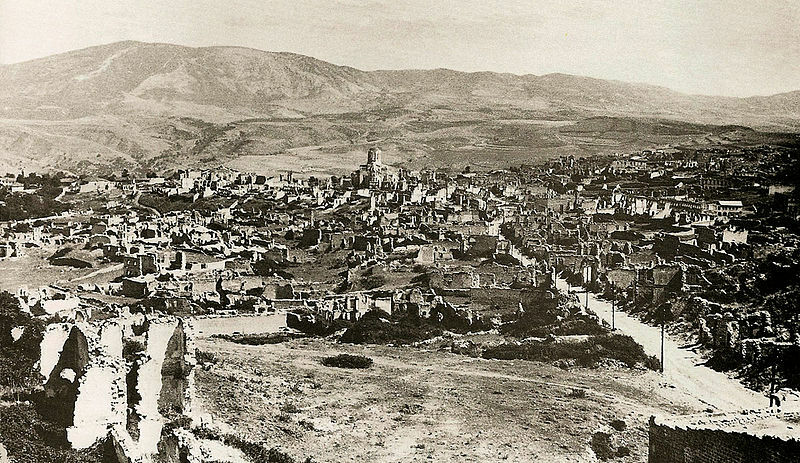 During the war, Shusha was used initially by the Azeris to shell the capital of Stepanakert. When captured on 9 May 1992 by Armenian forces, the Azeri population fled, while the city was looted and burned. Estimates suggest that, by 2002, 80% of the city still lay in ruins. I asked how many lived in the city today. “Perhaps three thousand?”. It seemed strange to think of three thousand people, the inhabitants of a small village, living within the ruins of a once large regional centre. 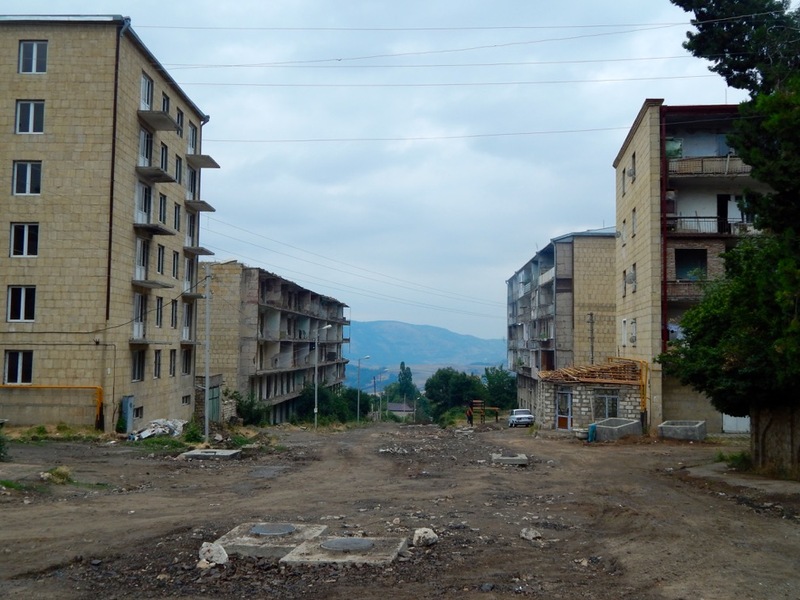 The roads that had led to Shusha from the country’s new capital, Stepanakert, were clearly new, yet they terminated among the smashed rubble and litter of the capital’s old squares. Muted tones pervaded the cityscape: grey, sand, the pale green of plants that had taken root among the split stones. And in the distance, the broad, sharp shoulders of the region’s mountains. In the embassy, I had been told that “Nagorno” means “mountainous”. Mountainous Karabakh, a “black mountain garden”. Urbicide is the targeted death of a city or the built environment. The concept describes the focused, strategic dismantling and destruction of that environment as a totality: infrastructure, housing, roads, shopping malls, capacity. Those parts that are the city must be throttled and decelerated. If “development” is about capacity building, then urbicide – the death of the city – is its undoing. For armies, the strategic value of such a tactic is clear. Cities are difficult to control, and, while constituting vital strong-points for defence, can represent locations of potentially drawn-out and costly urban warfare, from room to room, street to street, requiring the materials and tactics of FOFO (fighting in fortified objectives), or OBUA (operations in built-up areas). Dismantling the city from afar, utilising long range projectile weapons, represents, for some, a safer bet. It represents the controlled degrading of the built environment so as to make it uninhabitable, to remove it from the ‘war equation’. Consider the First Battle of Grozny during the Chechen War of 1994-95, in which the Russian army did vast and lasting damage to that major population centre, prior to their occupation of it. Many remember the famous contemporary photograph of a Chechen fighter standing in frame of the Presidential Palace in January 1995. It depicts a decapitated structure whose upper stories – the building’s head – disappear and estrange into blackened, snagged teeth, set against a backdrop of what Comaroff and Ker-Shing have called a “necrotic topology”, a semi-dead or decaying landscape; in this case, of decimated parkland and buildings riddled with bullet holes. The symbolic value of urbicide is crucial to its military “appeal”. A country’s capital, in a war of “fight or die”, is a synecdoche for the country as a whole. The destruction and evacuation of Azeri Shusha – during what was both an ethnic and political conflict – was a major symbolic coup for the Armenian and Karabakh forces, while its continued deterioration remains a permanent and ambivalent reminder of the war for Karabakians, a signal of both loss and remembrance. It is a “scar” terrain, as Lebbeus Woods has described, a site where a landscape or terrain bears the remnants of trauma and violence long after those events have passed. Shusha is not a secret. Tour guides are encouraged to bring visitors there, to walk among the smashed stones and amputated buildings, their knocked-out teeth and dislocated ribs scattering the pavements and over-grown lots. Particularly poignant are the two ruined facades and broken minarets of the city’s Mosques, which have subsequently been used to store cattle. The conflict, between Christian Armenians and Muslim Azeris, became entangled through the religious infrastructure of the region’s places of worship. The deconsecrated, eroding fabric of the mosques confirmed to us the ambivalent purpose of these ruins. Despite being boarded up, they represent value-rich symbolic victories. They confirm that the Azeri inhabitation of the city was firmly in the “past”. “There are no Muslims here now” our guide claimed. I wondered if that was true. In the Nagorno Karabakh embassy, in Armenia’s capital, Yerevan, we were encouraged to visit Shusha as much as the country’s many beautiful monasteries and its new, modern capital, Stepanakert. As we sat around the official’s table she made pointed gestures at the small-print names of so many villages and towns. And yet Shusha was the most important, the one we had all heard of. Its capture and annihilation was central in the Karabhakian claim to regional sovereignty. Like Shusha, Agdam was another city that we learned had suffered a similar fate, though nobody was willing to talk about it, or would close down any conversation which tended toward it. While the Armenian forces had decimated and caused the evacuation of Shusha, and while the Azeris had been engaged in their own operations to destroy the civilian fabric of the Armenian controlled Stepanakert, both cities had fortunately been spared the fate of Agdam. On the offensive, pushing the Azeri forces back toward the interior, the Armenians captured the Azeri city of Agdam, the capital of the Agdam region, in July 1993. When the city fell, its population was forced to flee eastwards into Azerbaijan. In order to prevent its recapture by Azeri forces, and to anticipate the symbolic implications of destroying a symbolically and ethnically important city, the town was raised to the ground with only the shattered remains of the Agdam Mosque surviving, among a tatter of other facades and shells. Unlike Shusha, Agdam is now entirely unoccupied, a site that continues to be used for military manoeuvres and repeated acts of re-destruction. On the horizon lay the entrenchments of the Azeri-Karabakh front-lines where, after we left the region, fighting flared up in a brief shooting war between the two sides in which a number of soldiers were killed. The highway that pointed toward Agdam and the front-lines, beyond the unused airport of Stepanakert, featured only the occasional car. Driving home the long-standing nature of these territorial and ethnic disputes, a nearby mountainside has been inscribed with the numbers “100”, burnt into the soil. One hundred years since the Armenian Genocide in Turkey. In 2020, it will also be a century since the “Shusha Massacre” (Shushii jarder), a mass killing of the Armenians of the city and the destruction of the city’s Armenian districts during their revolt against the Azerbaijan Democratic Republic. A March 1920 photograph of Shusha displays a scene of eradicated and necrotic architectures, jagged partition walls, sprays of stone and tile, and the pitted and defaced surfaces of the city’s Cathedral, which has been only recently repaired for the second time after the 1992 – 1994 campaigns. For Mandelstam, the “dead” windows were a clear indication of the civilian dead, of the act of subsequent evacuation and escape, urban cleansing as ethnic cleansing. The city was again confirmed as a site of deterritorialisation and de-legitimation. To reject the Karabhakian/Armenian claims of self-determination in the region, the Azeris chose to pulverise their district of the city in 1920. The war of 1988 – 1994, and the later re-destruction of Shusha, acquires a dark resonance of a conflict that has lasted, in some respects, for one hundred years. So, in July 1993, Agdam joined a long list of other utterly obliterated urban environments, from Carthage, its fields sewn with salt, to New Orleans, Mostar and Basra. The connection between urban populations and the urban fabric are tantamount in these dynamics, cities = people as much as they = infrastructure and capacity. It is why there are calls to sublimate “urbicide” within the international juridical concept of genocide. As Achille Mbembe has argued, such operations constitute a “necropolitics” in which killing is combined with “the tactics of medieval siege warfare” adapted to “an orchestrated and systematic sabotage of the enemy’s societal and urban infrastructure”. Bulldozing, undermining, invalidating. It becomes an “infrastructural warfare”. 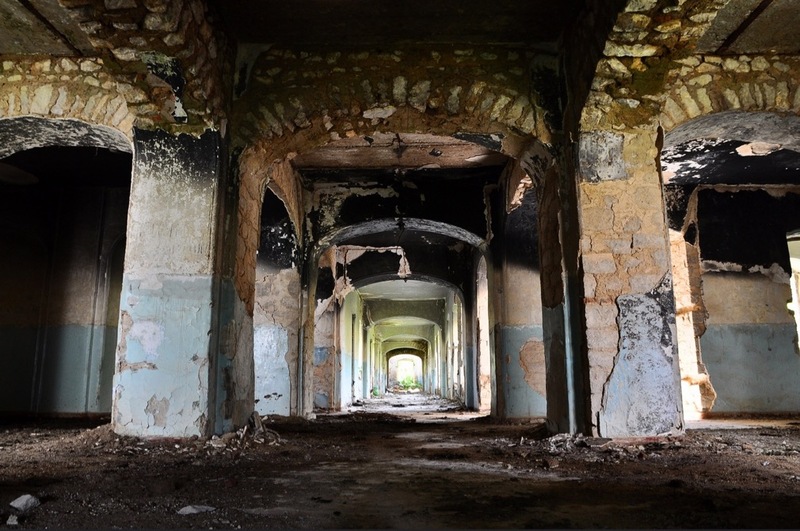 At the same time, Shusha is undergoing a slow regrowth after many years of neglect. Investors and local political figures are encouraging re-population. A new memorial to the war, a burnt out T-72 tank, sits at the town’s centre, while small hotels have begun to emerge to attract those coming to visit the newly renovated Ghazanehetsots Cathedral, among other sites. Not least those of the war. 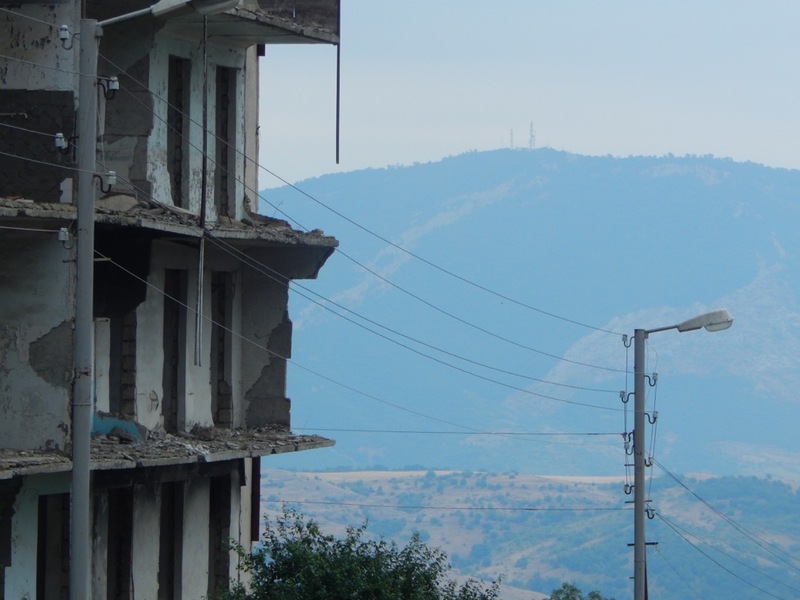 Locals are hopeful that development spending, and infrastructure such as the Goris-Stepanakert Highway, will encourage further reconstruction and resettlement. 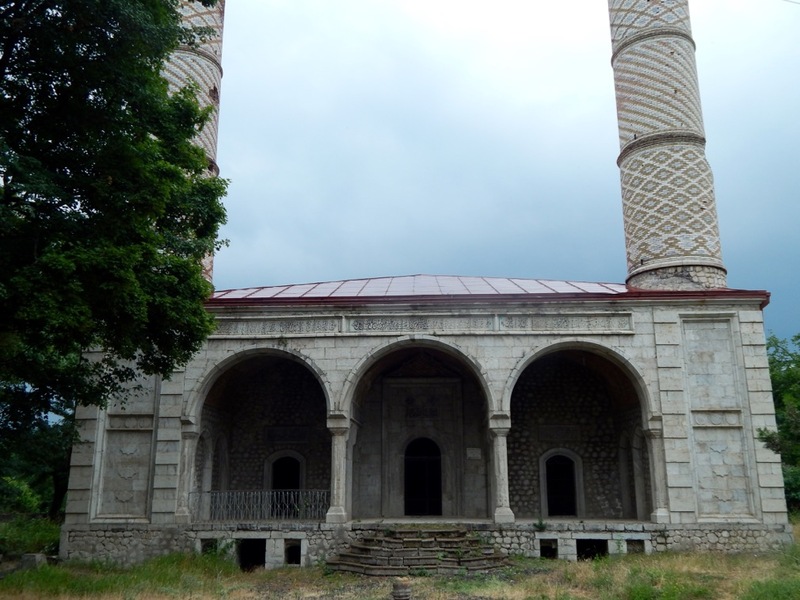 At the same time, it is impossible to ignore the fact that Shusha, like Agdam, has been exposed to destruction and the threat of destruction several times. For Martin Coward, “urbicide” should be understood as the attempt to destroy the material – and social – heterogeneity of the urban fabric, to destroy difference through annihilation. In the case of the border zone between Azerbaijan and Nagorno-Karabakh, this is expressed most tellingly in the strange blankness of the map. Crammed settlements give way to bare fields, dry grass, the sharp crenellations of the mountains and the blackened foundation stones of dead towns such as Agdam, abandoned train sheds, and roads which terminate in trenches. Places without names. Mosques without congregations. But while these cities are “dead”, they are not “forgotten”. Today, they stubbornly refuse to disappear. Their continued half-life of “being always almost dead” means that they remain ambivalent sites for remembrance and anxiety, as well as potential, hopeful sites for redevelopment and rapprochement.